The world of rowing is constantly flowing and evolving with HUDSON™ and its team at the heart of the action. Stay in the current with articles and events straight from the SHARK's mouth, or explore more about HUDSON and our history in the industry. History -- The evolution of HUDSON. How we went from wooden singles to becoming a world leading composite boat builder. Success -- The proof is in the results. See how HUDSON boats have performed at the highest level of the sport. Events -- HUDSON is present at most of the world's top rowing events. Explore a calendar of upcoming events. HUDSON partners with Fanshawe College to build a Boat Test Stand that is capable to measuring torsional and longitudinal stiffness. This article originally appeared on Row2k.com as a part of their Ask the Boatbuilder series. "What is Hydrodynamic Lift, and how does it affect my rowing?" The term hydrodynamic lift is not something I hear in casual conversation around the boathouse and consequently I thought we should rephrase the question before tackling the answer. Hydro is water, Dynamic refers to motion, and Lift is a force, perpendicular to the direction of motion, in our case vertical. So the question could be further interpreted as “When I am rowing at race pace, what forces are acting on the hull, and how can that knowledge be used to maximize speed?”. 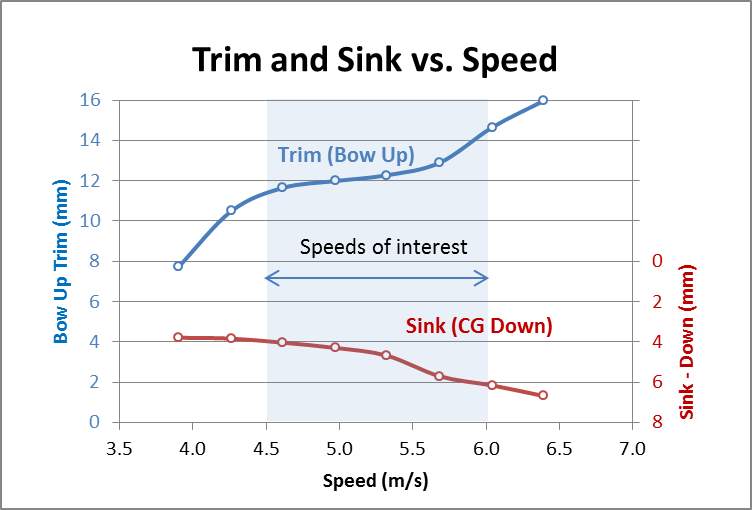 When a boat is moving through water two things will change - the trim (bow up or down) and the sink (an unfortunate term, but it refers to whether the boat’s center of gravity rises or sinks vertically). These changes to the boat’s attitude in the water are a result of the varying pressure on the underwater surface of the hull, combined with the wave form developed along the side of the boat (you can see the waveform in the towing tank photo above). The faster you go, the more the bow will rise and the stern drop while overall the boat “sinks” in the water. If you want to relate that directly to the term “hydrodynamic lift”, the boat is subject to an upward force (positive lift) near the bow and a downward force (negative lift) near the stern due to the motion of the water past the hull. There are various computer programs that calculate how trim varies with speed, and we have made use of both the simple and the complex in our assessment of rowing shells. The simpler programs use empirical formulae or wave and drag theories to calculate both drag and trim changes, while the more complex use unsteady CFD (computational fluid dynamics) that calculate from basic principles the motion of the shell as it varies speed and trim with each stroke. Each has its merits, cost, and time requirements and we choose the software to best meet the task at hand. In order to gain faith in the computer software, we have confirmed the sink and trim of some or our shells in the towing tank. The plot shown here is the towing tank output on a full size shell and has a few interesting points. Whether you are racing at 4.5 or 5.5 metres per second, the trim for this particular shell is fairly constant at about 12 mm bow up (and the stern would be about 12 mm stern down). And that value is something you, the rower, and we, the designers, can make use of. Although the boat changes its pitch due to your cyclical stroke, on average, for maximum speed, we want the boat to run level. So before you leave the dock, the boat should be 12 mm bow down, so that at speed the hydrodynamic effects will trim the boat level. We, and we presume other manufacturers, have already located the cockpit to give you that bow down trim at the dock and you can influence it further with crew placement. The crew’s location can easily be varied by moving the riggers, and foot stops fore or aft depending on the desired trim outcome. The sink which shows on this plot to be about 5 mm for the shell analyzed, is something you won’t be able to discern on the water and it is also something you can’t influence. There are two separate effects that cause the shell to sink lower as it is rowed. The first is the waveform along the side of the boat which has a trough near the mid length of the hull. With the surface of the water lowered where the shell has the majority of its beam and buoyancy, the boat sinks correspondingly. The second reason comes back to the discussion of lift. If water passes with some speed over a curved surface there will be a force created in the direction of positive curvature. In our case the accelerated water flow under the hull creates a downward force (Bernoulli’s Principle) and the faster the shell goes the larger the downward force. Hydrodynamic forces, due to the motion of the boat through the water will lift the bow and drop the stern and since the goal is to have the boat nominally level at race pace, you will want some bow down trim at the dock for maximum performance. Your foot stretchers and riggers should be adjusted so that the boat is slightly bow down at the dock and at training pace, but level at race pace. Recently, the largest rowing club in the world, Boston based Community Rowing, Inc. (CRI), decided they wanted to change this. CRI’s firm belief around equal access for all, regardless of ability, inspired them on their quest to give each of their 5000+ rowers access to the very best performance enhancing equipment. 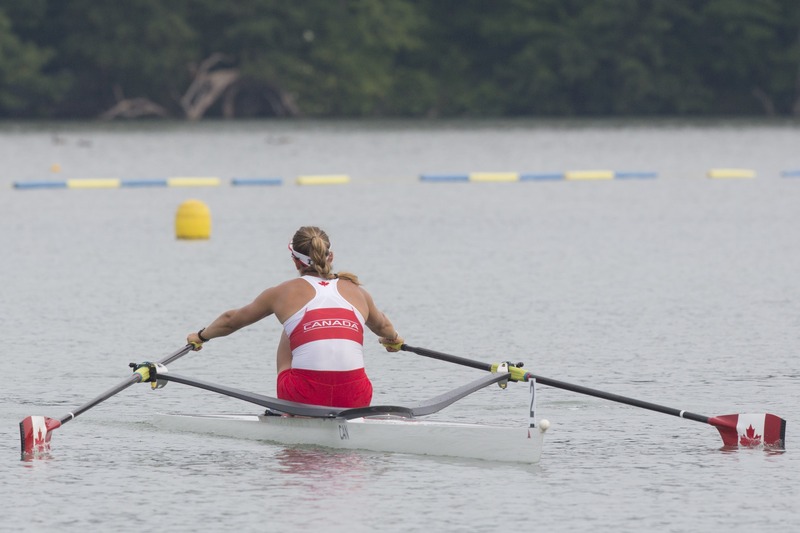 Being home to a diverse range of athletes – some with physical disabilities, some juniors, some carrying injuries and some competing at national and international level – CRI’s boats also needed to be completely adaptive. After a comprehensive tender process, HUDSON Boat Works won the contract to replace CRI’s entire fleet of 74 boats and they fitted them with the latest in BAT Logic technology. Download the BAT Logic Solution for your club. Key to delivering on these benefits is the installation of BAT Logic’s ShoePlate Pro QuickRelease performance foot plate and Nike Omada rowing shoes as standard across all boats. The ShoePlate Pro’s click-in click-out technology allows shoes and ShoePlates to be moved easily and quickly between boats. Traditionally, rowers have been expected to adapt to each boat and share shoes, regardless of size, fit and potential hygiene issues. With the BAT Logic system, they can take their own shoes and click them into and out of any boat or the ergometer. The increased connection and greater feeling of stability reduces the risk of injury and increases performance. Hygiene is also improved and the risk of infection from bacteria is reduced. Medical statistics put the proliferation of foot fungus which can cause Athlete’s Foot at around 13-20% in the general population. That’s almost 2 athletes in every 8 with an Athlete’s Foot type fungus – a statistic that can’t be ignored. Learn more about the benefits of BAT Logic. Download our product guide. The CRI project has been a resounding success, with the new high quality fleet resulting in a rise in standards throughout the club. According to Bruce Smith, Director at CRI, HUDSON and BAT Logic were well positioned to deliver on CRI’s vision. “HUDSON and BAT Logic have full control over their production process which makes them a strong partner for us,” said Bruce. The new fleet is now on the water, enabling rowers from all walks of life to perform at their best and raising standards for all through comfort, fewer injuries and increased performance. Most competitive sports, even at the Olympic level, use equipment that is not one-design. This somewhat surprising lenience permits the designer and manufacturer to give the athlete a small but still significant competitive edge. Rowing, in particular, permits unlimited freedom in the length, beam (width) and shape of a shell, with the only limitation being the overall weight. Some people might argue with the term “unlimited freedom”, but even the new FISA rules instituted in 2015 (all eights must be sectional with the longest section 11.9M), permit boats that are over five metres longer than currently built, so there is little restriction there. Over the years the development of shapes has been gradual, as one might expect of an evolutionary process, but now that we have towing tanks and computer software that can analyze the resistance of long slender hulls, we can speed up the analysis of many possible hull configurations. 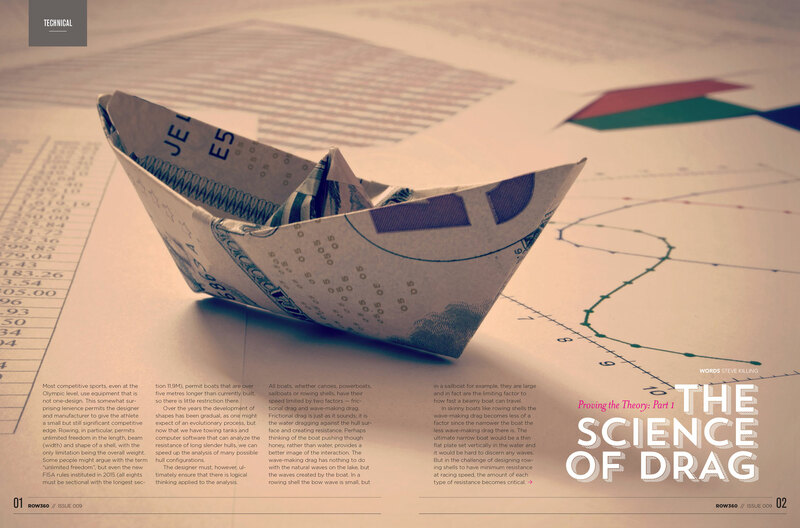 The designer must, however, ultimately ensure that there is logical thinking applied to the analysis. All boats, whether canoes, powerboats, sailboats or rowing shells, have their speed limited by two factors — frictional drag and wave-making drag. Frictional drag is just as it sounds; it is the water dragging against the hull surface and creating resistance. Perhaps thinking of the boat pushing though honey, rather than water, provides a better image of the interaction. The wave-making drag has nothing to do with the natural waves on the lake, but the waves created by the boat. In a rowing shell the bow wave is small, but in a sailboat for example, they are large and in fact are the limiting factor to how fast a beamy boat can travel. In skinny boats like rowing shells the wave-making drag becomes less of a factor since the narrower the boat the less wave-making drag there is. The ultimate narrow boat would be a thin flat plate set vertically in the water and it would be hard to discern any waves. But in the challenge of designing rowing shells to have minimum resistance at racing speed, the amount of each type of resistance becomes critical. Fig. 1 - The top blue shell has a bias towards reduced frictional drag while the longer orange shell keeps wave-making drag to a minimum. If frictional drag were the only component of concern, the boats would be very short to keep the surface area touching the water (the wetted surface) to a minimum. If wave-making drag were the only drag, the boats would be very long to keep them narrow and the waves they produce small (see Figure 1). The reality is in between these two, but optimizing the length requires a rather exact knowledge of the value of each type of resistance. 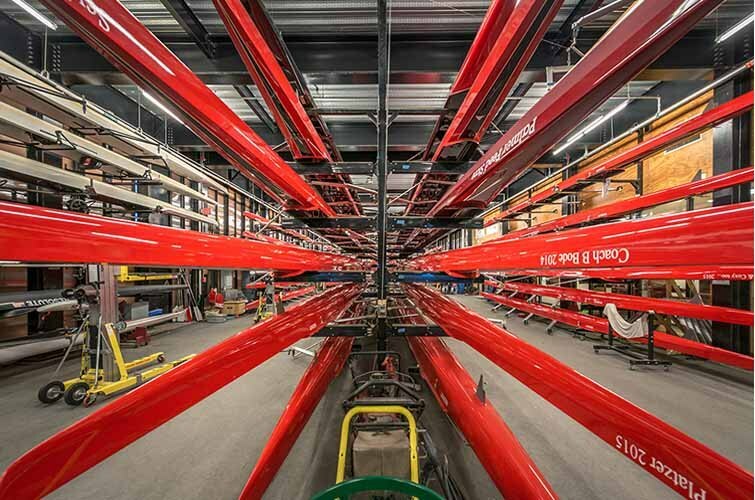 A comparison of different manufacturer’s products in your boathouse can show variations of a metre or more in length, all designed for the same class and weight of rower. Different theories and varying experience levels have led to different conclusions. Fig. 2 - A typical wave plot showing transverse waves behind, and divergent waves emanating from the bow, for a narrow hull. Fig. 3 - Upright Resistance versus Speed - Frictional Drag dominates the overall drag in a rowing shell. In this example 4 person shell 88% of the drag is due to wetted surface friction. (Predictions made with Flotilla software)drag to a minimum. The components of frictional and wave-making resistance for a typical four-person shell are shown in Fig.3. 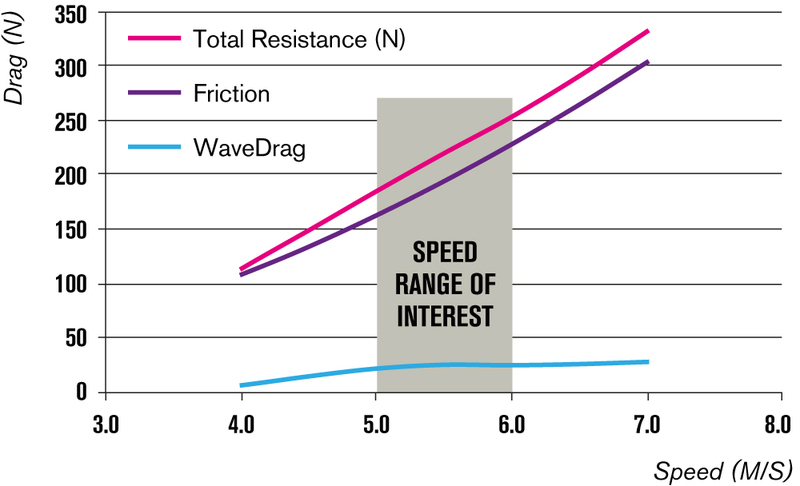 It can be seen that the contribution to overall resistance due to wave-making drag is very small, in the order of 12% of the total at a normal racing speed of 5.5 metres/second. The initial reaction of the designer to optimising this boat might be to concentrate on keeping the wetted surface to a minimum as it is creating most of the drag. That is true but the subtlety of the trade-off of those two factors with length is very important and sometimes surprising. The shells that you row have been designed to give minimum drag for a given weight and skill level of crew. A novice crew will row faster in a boat that has greater stability than one designed for an experienced crew. In order to optimize the length of a shell during the design process, the fixed parameters must be set carefully. We must consider not only minimising the drag of the hull, but setting a minimum internal width of the boat to accommodate the crew and setting a minimum permissible stability that we know the targeted crew, experienced or intermediate, can handle. The consideration of stability has a marked effect on the outcome of such a study. In my experience, for a given length of hull, a rowing shell can always be made faster by making it narrower (and a bit deeper). However, doing so will take the stability below the acceptable value for the crew. So the minimum resistance is governed by the stability of the boat. 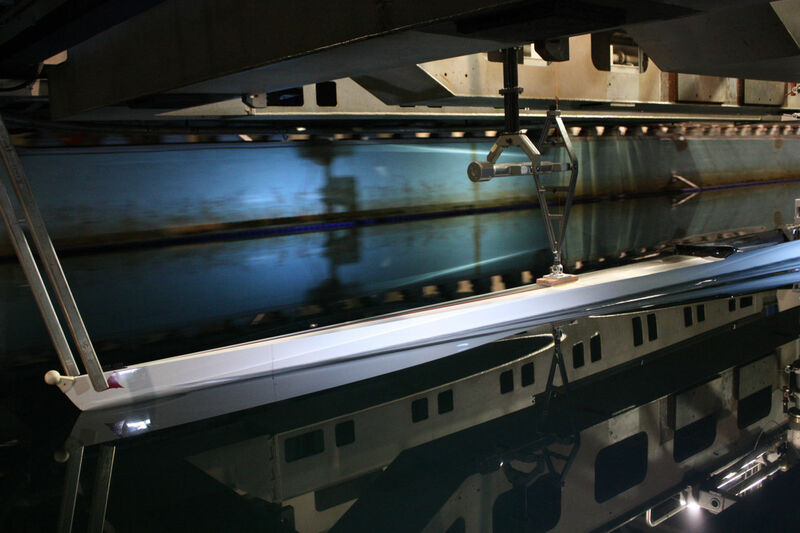 In performing a length study, therefore, for each length the minimum resistance will be achieved by the narrowest boat that will still offer the required stability for the crew. Fig. 4 - For a given hull length, variations in width and depth are plotted below their total resistance. The left hand hull although it has the lowest resistance, is below the allowable stability and therefore does not qualify to be part of the optimized length study. Fig. 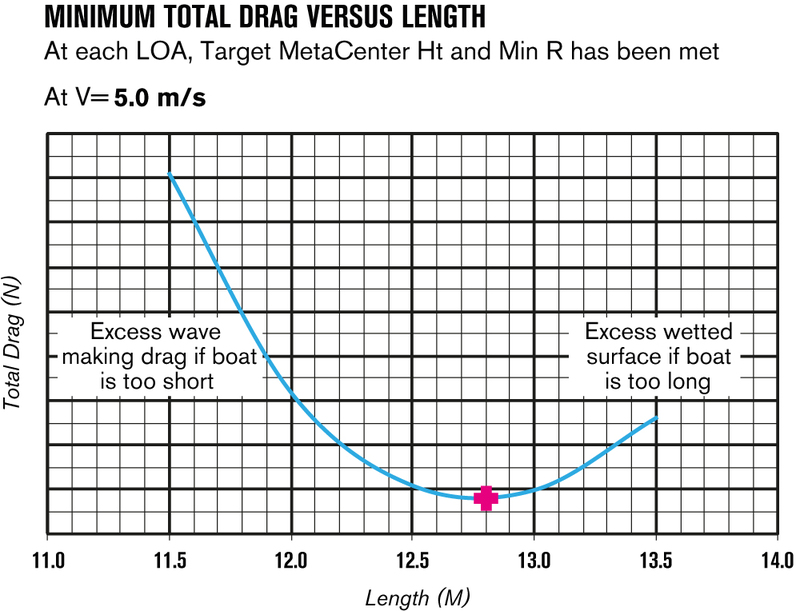 5 - Minimum Total Drag versus Length - A plot of Drag versus Length illustrates that there is a penalty in designing too long (too much wetted surface) or too short (too much wave drag). In Fig.5 you can see the total drag of a series of shells with the same crew weight, but with varying lengths. The width, out of necessity, must increase as the length reduces in order to keep the volume and therefore the load capacity the same. The plot of total drag versus length shows there is an optimum length for this particular weight class of shell. At this point we need to be cautious about final decisions for the parameters of a new boat. It is important to know the theory behind, and limitations of, the particular software being used. Since the trade-off between frictional and wave-making drag affects our choice of a longer or shorter boat, the software’s assessment of those factors is important. We have done careful validation of the computer code that we use and each manufacturer will have done the same. One must understand when to accept the predictions at face value and when to use other tools to assess the performance. This optimal length analysis is unique for a given crew weight and that leads to most manufacturers having several weight categories and lengths for each type of rowing shell. With careful use of software and some way to validate the drag that it predicts, the designer can create a rowing shell of minimum resistance, giving the rowers a small advantage to take into every race. If your crew were to row the same boat that my crew had just vacated, the stability would not only feel different, it would actually be different. Perhaps it seems illogical, but the same hull will have a different stability depending on the weight of the crew rowing it. As the rowing shell is loaded more heavily and sinks lower in the water the stability is reduced. This is counter to the experience of sailboat owners who may add ballast to their boats to make them more stable. The difference here is that the weight we are adding is the crew, a moveable weight well above the centre of rotation of the hull. When a lightweight eight is taken for spin by the mid-weight men, they may have trouble setting it up. Shells are designed for a given weight class and typically if you are lighter than the intended weight class for the boat you will find it easier to balance. If you are heavier than the weight class the boat is designed for and are an experienced rower, you may be able to set up the boat and row well or the shell may now be too unstable to row efficiently. Being aware of the stability change with varying crew weights may help you and your coach better understand how a boat feels on the water.